Home IBPS IBPS-CLERK STUDY-PLAN Expert Tips to Crack IBPS Clerk Prelims 2018 in Just 15 Days? 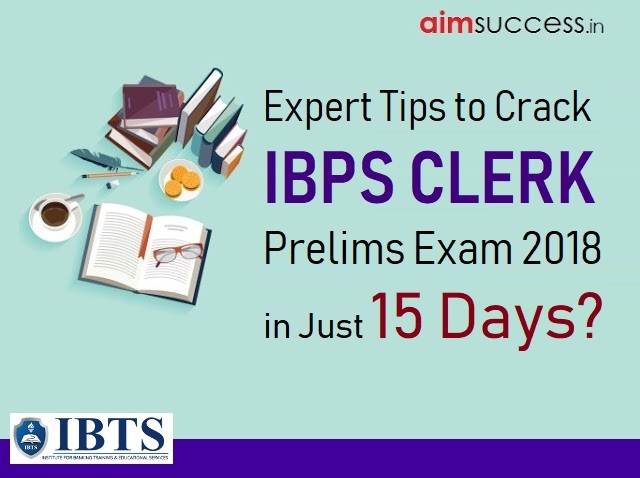 Expert Tips to Crack IBPS Clerk Prelims 2018 in Just 15 Days? Institute of Banking Personnel Selection (IBPS) will conduct the prelims examination in the month of December. The dates for prelims examination are 8th, 9th, 15th & 16th December. The Recruitment Examination will be conducted online in a Computer-Based Test (CBT) format. While most candidates are used to the exam pattern and environment, some still find it difficult to keep up with the pace of the examination. Since our motive is to squeeze the study plan in 15 days, we expect all IBPS aspirants to stick to the schedule for the next 2 weeks. We have seen a lot of students getting Panicked by some of the toughest questions and they fail to attempt the easier ones due to nervousness. To avoid such situation, we are providing you few points that will help you getting used to with the Surprises and changes. Although the cut off is different for different States, targeting 70+ in IBPS Clerk Prelims Exam 2018 will take you to the safer side. As sectional timings have been introduced in the Pre Exam, we would suggest you to Practice each section. This can be a Game Changer for you. You will have to attempt maximum with confidence in your strongest area. If you still have not identified your strength, then its a concern. We would recommend you to start Practicing the mock tests. Take mock tests to test your preparation. It will help you evaluate your preparation for the exam. Taking mock tests will help you analyze your weak points. That way you’ll know which areas you should focus on. Appear for sectional mock tests and analyze the score. You can find the areas for improvement in each section. Appear for another test after reading those missed topics, you will feel the difference. Do it for each section individually. Once you are done with sectional tests, appear for the full-length mock test and analyze the score and timing sectional and overall. Try to minimize the timing to be dedicated to each section so that you Qualify each section with a good score (that will be helpful in matching up with overall score). Dedicate 2-3 Day to Each section to cover the basic revision of the concept and start practicing. Follow the rotation rule that will build your interest in reading. Taking a page off the revision plan, you need to devise a proper strategy to give preference to each section. It’s usually seen that when you engage in heavy preparation last moment you tend to get mixed up and build up undue stress which, again, is not what you would want to do. At no moment, we recommend any cramming of any kind. Anything that breaks your revision cycle or paper analysis time must be dropped without any second thoughts. You need to put a full stop on your preparation right here and go full throttle on revising everything you know. As of now, your revision plan shall include solving sample papers on a daily basis, as more and more practice will lead to the strengthening of question-solving skills. By doing this, your performance will be better after each test. A Candidate has to prepare himself/ herself for the exam and decide which part should be attempted first. A candidate should leave the question if it’s time-consuming. He/ she should not spend too much time on any particular part of a problem. If possible, skip the topic which is lengthy and time-consuming as they consume a lot of time. Before giving the exams, the student should try the test series so that he can analyze the time consumed by him to complete paper. Last but not least, Always keep calm. As only a few days are left for the exam, the first and foremost thing is that you take good care of yourself. You need to stay healthy and sleep well and try to avoid chores that can cause any injury to you. You need to be relaxed and calm as it will give you a better clarity.